Some scientists believe that pressure to perform well creates distractions. 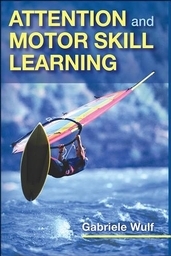 Even though motor skills vary, the learning process that individuals go through when acquiring those skills is similar. Focusing on the goal allows the motor system to “spontaneously” produce effective movements. Some scientists believe that it is important not to think about the movement while executing it. Insights into the various facets of expertise of concert pianists, as well as the role their attentional focus plays in delivering a “perfect” performance. Attention and Motor Skill Learning explores how a person’s focus of attention affects motor performance and, in particular, the learning of motor skills. It synthesizes the knowledge coming from recent research examining the effects of attentional focus on motor performance and learning, and it provides practical implications for both instructional and rehabilitative settings. Attention and Motor Skill Learning challenges traditional views that the method of learning a motor skill involves focusing attention on each part of the skill and internalizing proper execution. Instead, author Gabriele Wulf argues that the learning of new motor skills suffers when attentional focus is on the coordination of movements. When attention is directed to the desired movement effect, however, performance levels rise. Not only is a higher level of performance often achieved faster with an external rather than an internal attention focus, but the skill is retained better. The advantages of external focus apply to a variety of skills and skill levels and may be used while instructing athletes, children, and those with physical impairments as well as in any setting in which effective and efficient training of motor skills is a concern. including comparison tables and offering suggestions for differentiating instructions regarding internal and external foci of attention. To help teachers understand how the wording of their instruction can facilitate the learning process, Attention and Motor Skill Learning shares insights from athletes, musicians, and speech therapists on their thinking as they perform or teach selected skills in each chapter’s “Attentional Insights” section. The “Future Directions” sections at the end of each chapter highlight potential research studies that challenge readers to use and further develop the methods and practices in the book. Other useful features include case studies and chapter-opening scenarios that present motor-learning problems and demonstrate the role of attentional focus in solving them. Attention and Motor Skill Learning provides many practical examples and implications for teaching, learning, relearning, and performing motor skills. This book will help readers better understand the effects that attentional focus has on motor performance and learning as well as the mechanisms underlying these effects. While challenging traditional learning methods, this book presents the latest research and demonstrates how changing one’s focus of attention can speed the learning process and lead to more effective performance of motor skills. A text for graduate-level courses and seminars and for upper-level undergraduate motor behavior and cognitive psychology courses. A reference for motor behavior and human movement specialists and researchers; instructional strategies and pedagogy instructors; sport psychologists; physical education and adapted PE teachers; coaches; music teachers; and physical, rehabilitation, and occupational therapists. Gabriele Wulf, PhD, is a professor in the department of kinesiology at the University of Nevada at Las Vegas. Dr. Wulf has more than 100 publications in motor learning and control and 35 publications related to attentional focus and motor skills. She initiated the line of research described in this book—external versus internal focus of attention—in the mid-1990s. She has been a section editor for Research Quarterly for Exercise and Sport and Women in Sport and Physical Activity Journal and has been an editorial board member for Journal of Motor Behavior, Human Movement Science, and International Journal of Fitness, as well as an international advisory board Member for Physiotherapy. She also served as secretary and treasurer from 2002 to 2004 for the North American Society for the Psychology of Sport and Physical Activity. In her leisure time, Dr. Wulf enjoys working out, skiing, windsurfing, scuba diving, and riding her motorcycle.